The last big algorithm update for local search was from Possum 2 years ago. Although there hasn’t been anything as big since, Google My Business saw numerous new developments announced in 2017, pretty much every month. With the odd one possibly passing you straight by. One of the more recent Google My Business updates was the launch of Questions and Answers. Announced in early August 2017, Google’s new Q&A feature gives both new and existing customers the opportunity to ask questions directly to companies via the Knowledge Panel. Like everything in life there are always pros and cons. That’s why I’ve put together an overview so you can decide for yourself whether this new feature gets thumbs up or thumbs down. To recap, Google Questions and Answers was first launched on Android Google Maps only but you’ll be happy to hear it’s now available on iPhones and has also rolled out on desktop. As a business it isn’t something you can opt out of and it’s not currently visible in the GMB dashboard. From a business perspective it’ll allows any new, and of course your existing customers to ask questions about your company before they visit. Great I hear you say! Whether that be ‘do you have a car park?’ or ‘do you accept credit / debit cards.’ You’re helping to paint a bigger picture of your business before customers have stepped through the door. Now to you know more about Google Q&A, more importantly where to find it and what it looks like, let’s get down to the nitty gritty. Pro – Questions can be upvoted, making popular ones more visible and most likely to be answered. Helpful answers can also be upvoted, so others can find them easily. Con – Upvotes don’t need to be approved, so even though the user might find the information helpful, it may be incorrect. Pro – As a busy business owner you’ll be happy to know that other people on Google Maps can answer your questions. One of these being Google Local Guides. 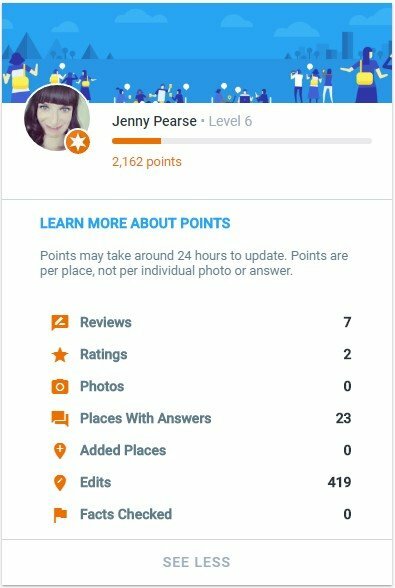 They must be levels 2 and up and the Q&A feature is available to them on both Google Maps for Android and Google Search on any mobile device. Con – With Google Guides being incentivised through a points system, you may find the same question being answered numerous times. Crowdsourcing answers for a business can also lead to inaccurate and spammy information. To avoid this the feature needs constant monitoring by the business owner or agency which can be very time consuming for those with hundreds of locations. It should be noted that at the moment questions from other users can’t be deleted, only flagged. Pro – You’ll be happy to hear that your users get notified through Google Maps when their answer has received a reply. You’ll also receive notifications when a new question is asked. Con – The downside is that map alerts are only available on Android. Meaning you have to be logged into the Google Maps app with your GMB account to receive push notifications. For those on iOS there is no other option but to check your account regularly. Depending on the number of businesses you own, this could be very time consuming. Pro – Similar to positive reviews, Google Q&A has the potential to increase conversions to your website. For example, if a user with celiac disease sees that your restaurant offers a gluten free menu, something they weren’t previously aware of, they might be inclined to book a table. Con – Because other people on Google Maps can answer your questions there is potential for answers to be incorrect. This could have a negative impact on your business. Pro – You’ll be happy to know that Google moderates some things automatically (bad words, gibberish) and users have to ability to flag anything inappropriate. This is a similar process to photo/review flagging. Con – It can take several days for flagged items to be assessed and this doesn’t necessarily mean it will be taken down. What important people are saying? Add frequently asked questions and answers so that users searching for your place on Google Maps on Android can easily get the answers to common questions about your business. Answer questions from potential customers – if you have Google Maps on Android, we will send you a push notification when a new question has been asked about your business so you can share an answer. Thumb up questions and answers from other people to bring attention to helpful contributions from the community. When new questions and answers are posted to your listing from the community, we will notify you. Tom Waddington pointed out that a business owner would have no idea if the user goes back and edits their question later. For example, I could post a question on the listing for a restaurant asking, “Are there vegan options?” If they responded with just “yes,” I could go back and edit my question to change it to, “Have you been cited by the health department?” and the answer would stay the same. It’s always best to stay one step ahead of spammers. We all know this feature is going to get abused at some point. The fact that Google has invested time and money, over the last 12 months, making Google My Business even better only emphasises its importance for local businesses. If the data is good and useful there is the possibly that Q&A could even be used for ranking. So whether you accept Google Q&A with open arms or have concerns, one thing is for sure – I think it’s here to stay. If you have any success stories using Questions and Answers I’d love to hear about them. Feel free to reach out on Twitter. It’s not too late to get set up or claim your business listing on Google My Business. Google Maps help for Q&A – https://support.google.com/maps/answer/7421661.